What's the fate of Mumbai's Kaali-Peeli? What’s the fate of Mumbai’s Kaali-Peeli? A new era of transportation has arrived in the city of Mumbai. One can almost hear the faint cry of Mumbai’s original taxi, waiting to be summoned by a tired Mumbaikar on a warm evening, but the sound of the uber-cool cabs covers it up. 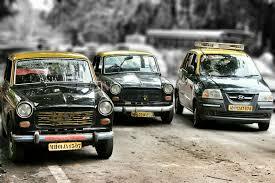 The legendary black-and-yellow cabs, locally known as the ‘Kaali Peeli’ have been around for more than one hundred years in Mumbai. While we can still see the roads swarmed with these, the pride of the Kaali-Peeli has now been reduced to a lot of once-upon-a-time stories. They ruled the roads, lanes and bylanes of Mumbai once but are being replaced rather steadily by an unhindered surge of private cabs. But of course, as Amitabh Bachchan put in a film called ‘Cheeni Kum’, saying ‘cab’ is not as much fun as saying ‘taxi’ is. This sentiment is still positively shared by lakhs of Mumbaikars who have moved to the newer, cleaner, and colourless versions of public transportation. Back in the 1960s, Premier Padminis were the queens of the streets. Even stars like Mammooty and Rajinikanth owned them. These were much-loved and seen in numerous films and heard about in the stories told by our parents. However, about four years ago, Premier Padmini died a slow, gradual death when a resolution that was issued by the government of Maharashtra reduced the age limit of Padminis qualified for Mumbai roads had to be no older than 20 years, the previous limit being 25. At one point in time, there were as many as 63,000 taxis running across the city. Back in 1997, the number of cabs was 63,000 when the government began to issue the Public Services Vehicle Authorisation badges which are mandatory for every taxi or auto driver to private taxi fleets. About 90,000 taxi drivers had them, but it meant that not many could now enter the profession of driving a taxi in Mumbai. In order to get the badge, one has to be a domiciled citizen, which was not possible for a lot of migrants that came to the city of dreams, chasing theirs. That time, almost all cabs were Premier Padminis. The city continued functioning the way it did, albeit with a few hiccups when about a decade and a half later, cab aggregators began entering Indian markets. It was a little tough in the beginning for the people to trust something that electronically called a transportation – with the click of a button. For the older generation, it felt like magic as they struggled to adapt to the new system, while the young crowd eased itself into the system of Ola, Uber and Meru.